In a traditional sense, the concept of crowdsourcing has been used to complete a specific task by utilizing a vast workforce. Whether the task involves funding a project, solving a complex problem, or even finding a missing person, the operation is the same – bringing together myriad resources in minute amounts to achieve substantial results. Today, the advent of instantaneous digital communication has allowed this process to expand even further. In this week’s blog, we’ll show you some ways you can extract some real marketing value out of this tried and tested method, and it all starts with thinking slightly outside the box. Steve Jobs said that innovation is what distinguishes those who lead from those who follow, and in the marketing world, the cutting edge is one of the most advantageous spots to set up camp. New ideas and groundbreaking tactics are often at the heart of a brand’s success, and not just because trends can quickly turn down that dark and dangerous road to the land of the passé. There’s also changing consumer attitudes and expectations to consider. And what’s the best way to tap into that oh-so-valuable perspective? You guessed it, crowdsourcing. People love the feeling of being involved, whether that means taking up a charitable cause, volunteering, or voting in a local election. Chances are if you provide an opportunity to give your audience a voice, more than a few will take up the offer. So how does that benefit your marketing? In terms of garnering engagement, no resource is more useful than social media. These networks represent the most effective way for a business to open a direct line of communication with its audience. Due to their very nature, crowdsourcing opportunities abound with these assets. New marketing tactics and promotional approaches aren’t the only things crowdsourcing can bring to light. The process of creating a public forum can also assist in product development. How? Through the art of real-world testing. With this kind of crowdsourcing, you can gather insights “from the ground” and in real-time. Think of it as a large-scale beta test before a full-on product roll out. You’ll be able to resolve any kinks and make sure that when all things are “go,” you’ll be putting out a better, more reliable product. Another way this can tie in to all the situations we’ve mentioned so far is through incentive. Offering your customers a tangible reason to participate in crowdsourcing (like an early bird discount or the opportunity to purchase the product before it’s released) is paramount to achieving the results you want. In the end, you’re left with a better offering, more brand advocates, better customer relationships, and ultimately, lower costs. 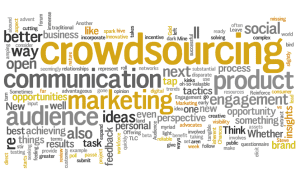 Are you ready to incorporate crowdsourcing into your next marketing campaign? Leave a comment and share your ideas!